This funky monkey of a Meatpacking District pub is one of the best spots in the 'hood for a good pint. 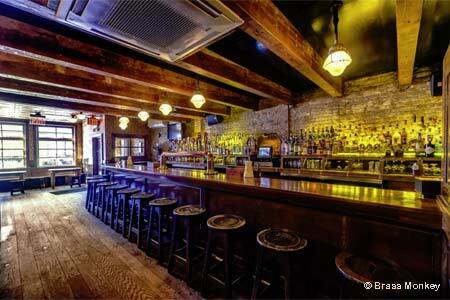 : The West Village's Brass Monkey, bedecked in warm wood, offers over sixty beers (on tap and in bottles). The Monkey is one of the only bars in New York (if not the United States) to offer the original Budweiser on tap (due to a legal dispute with Anheuser Busch, the delicious Czech beer is sold as Czechvar in the States). The back room has booth and table seating and serves above-average pub grub such as ribs, steak sandwiches, salads, mussels and chicken potpies. When the weather is warm, take your pint in front and watch the models walk by.